We spoke to pianist Robert Mitchell about his upcoming solo piano album The Glimpse (released 18th February 2013 on Whirlwind Recordings, with a tour beginning at the Royal Festival Hall on 18th January 2013 ) and a corresponding festival, Leftitude at the Forge in Camden (20-21st March 2013) . The album combines through-composed pieces and improvisation. LondonJazz: There is something very different about this album isn’t there? 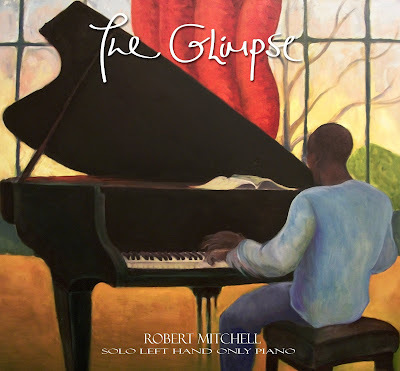 Robert Mitchell: This is a solo piano album of music for left hand alone, and this came out of an interest now of a few years which was sparked by a lovely moment during a commission for a wonderful pianist (Ivo de Greef). I decided to challenge myself and write this classical tune for left hand alone and after about two weeks of panic, I started to really enjoy myself and I vowed to see if I could do the same thing involving improvisation as well. LJ: And it leads you into a different kind of world doesn’t it? What are the implications of playing with just the left hand? RM: I’m working on the perfect phrase to describe this (laughs), but it involves walking a tightrope; every decision and every detail has to be executed with more definite thought. There’s less room to be indecisive and that’s magnified even more in improvisation terms; every event, every turn you take in the solo becomes something you have to live with in an even larger form. LJ: There was a real epiphany moment you had as a teenager when you were drawn to a different kind of music late one night? RM:That would have been hearing Oscar Peterson on a large commercial London radio station at a very unexpected time, in terms of what they programme and when, but at the right time for me; I had been playing piano for 10 or 11 years at that point and it made sense, I could hear a lot of classical influence in his playing but the way it was being used was a revelation to me and that sparked me running to buy albums of his the very next day. LJ: Going back to the album, you say you’ve dedicated The Glimpse (the album is launched on Whirlwind Records on D A T E ) to “those who have continued to perform the piano with a single hand after injury or illness.” Can you tell us a bit about that? RM:There are a number of figures both in classical music history and jazz piano history who have done exactly that, the legendary pianist Paul Wittgenstein for example, who lost part of his right arm in WWI but returned to, not only develop a career (he was very famous in his day), but was also via inheritance, very able to commission some of the most famous composers of his day, of any day actually, so that would include: Ravel, Richard Strauss, Benjamin Britten, Korngold. They responded with just simply amazing music, not so much about it being performed only by the left hand, but really creative responses in each case. RM: In Jazz, there are a variety of instances from Bud Powell being challenged by Art Tatum on the response of criticism for not really using his left hand much when he was performing. In general terms: through Bill Evans having to perform with trio at the height of one of his unfortunate drug addiction periods and onwards to people like Phineas Newborn, Kenny Drew Jr. and the recently passed away: Bora Bergman, an amazing innovative pianist, who dedicated a good deal of his ability to furthering his own left hand aptitude. RM:Yes, it's over two days ( 20th and the 21st) I'll be performing on the 20th along with the wonderful classical pianist and scholar Clare Hammond, and on the previous day (the 20th) we have a great improvising pianist Pat Thomas and Ivo De Greef who was very involved in my initial interest a few years ago thanks to the commission I wrote for him so, a really lovely bunch and I thought I would give this a go. I have done a little piano festival before in London at the Pizza Express a few years ago but that was very definitely for two hands (laughs). So, as far as we are aware, this is a first. LJ: And what you’ll do on your other concerts in the tour is that you’ll play one set of left hand won’t you? RM:Yes! And one set with both, so it will be a mix of the music from the album, maybe a couple of left hand only things that didn’t make it as well, and then repertoire from my sort of recent past and maybe some audience-derived improvisations as well. LondonJazz: And I gather you’re talking to Nicholas McCarthy is that right? Robert Mitchell: Yes, [he is] a fantastic pianist who is the sole left-hand-only repertoire graduate of the Royal College in its history. He played in the closing ceremony of the 2012 Paralympic games, and also the closing ceremony of the BBC Piano season. And he has had a deserving tv presence recently too. He will be interviewing some of the artists live on stage before the performances. He is also co-artistic director (along with myself) for subsequent editions of the festival. And he will of course perform ( in a future edition of Leftitude). Robert Mitchell Music website and leftitudefestival.com- for more information , tickets and a newsletter. Robert Mitchell's solo tour is supported by Jazz Services, Arts Council of England and PRS For Music Foundation.